GRBaV, The Vector, Which Mite It Be? At a recent UC extension course, “Current Issues in Vineyard Health”, an impressive group of researchers presented their work. Dr. Brian Bahder revealed evidence of a second variant of GRBaV, commonly called red blotch virus, that seems to have invaded a block at the UC Oakville Station from a different direction. He also reported finding both variants in wild blackberry, adding that prolific bush to wild grape as natural reservoirs of the disease. Perhaps poison oak will be next? The tone of the presenters at this course was very skeptical of a paper by Dr. Bahder’s old colleague and fellow doctoral candidate at Washington State, Dr. Poojari, (et. al 3013) which reported evidence that the Virginia Leafhopper could transmit the virus. What Dr. Poojari did was let Virginia hoppers feed on infected plants and then move them to uninfected plants. His result was that an identical virus was transmitted to the uninfected plant. Seems pretty solid, but I have heard suspicions of contamination of the supposedly uninfected sample. Dr. Bahder found at a Davis increase block that was fairly crawling with Virginia hoppers that little or no transmission seemed to be taking place, but at the Oakville Station where the Virginian has not yet arrived significant transmission is well documented. Even in Washington the Virginia hoppers seem not to be transmitting the virus in the field. Obviously transmission of blotch is taking place out of the range of the Virginia hopper. Still, Dr. Bahder’s picture of blackberry looked pretty well hopper chewed to my eye. Unless Dr. Poojari’s receptor vines were contaminated, his work shows at very least that hoppers are biochemically capable of transmitting the virus. Vector relationships are complex and usually specific. They involve interactions between the viral coat proteins and proteins in the vector’s digestive tract. The virus must survive in the vector at least long enough for the vector to move to another plant. 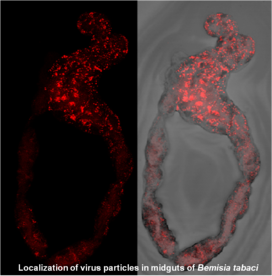 Relationships seem to range from short-term persistence in the mouth of the vector to “circulative” virulence where the virus takes a ride through the insect and into its salivary to long-term arrangements where the virus reproduces in the vector . We don’t even have the first clue about much of this stuff in the case of blotch, but those of us with more than an academic interest get an automatic license to think. We live and bleed with the enormous financial consequences of this disease, and so can be forgiven an abductive thought experiment. 1. There are at least two variants and one may be more recent. 2. A substantially similar virus has been documented in a grape leaf collected in Sonoma County in 1940. 3. Blackberry and wild grape harbor the virus, possibly by transmission from vineyards. 4. Koch’s postulates seem to have been fulfilled. 5. One or two year latency has been reported between detectable titers and symptoms. 6. Symptoms appear to have increased exponentially in the last season. 7. There appears to be an edge effect resulting from transmission from neighboring vineyards and woodlands. 8. There appears (to me anyway) to be a road effect of transmission by machinery, dust, or tissue. What sort of vector could do all of this? Let’s start out with the known vectors of Geminiviridae. Not that this list should be exclusive, but vector relationships are often conserved. One can see from this after Hogenhout et al 2008 that the list of suspects is rather small and that whiteflies and leafhoppers do all the known damage with the lone exception of one case of a treehopper, a similar insect in the same family as the leafhopper. But there is a problem because GRBaV coat proteins are very different from the four genera above and may eventually become its own genus. 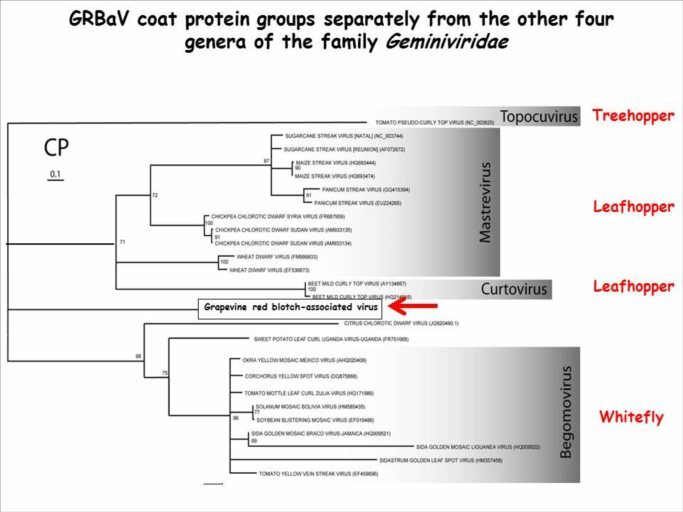 This graphic by Dr. Fuchs shows that GRBaV coat proteins hark back to the family of all Gemini virus genera. This family is believed to have evolved in Africa from algal plasmids before the breakup of Pangea and New World Geminiviridae seem to lost the Old World retinue of “satellite” molecules by evolution in isolation. These images by Dr. Monica Gotz show Begomovirid proteins fluorescing in the gut of a whitefly. All things considered, what little we know of Geminivirid vectors is not much help. I have heard verbally from someone who ought to know that white flies have been considered and rejected as GRBaV vectors, and the UC groups seem not at all salubrious about leafhoppers, in spite of having vacuumed them up for testing last season. Furthermore, most plant virus vector specificity is at the genus level. As Dr. Fuchs has shown, GRBaV coat proteins hark back to the family level. This may well mean all bets are off regarding potential blotch vectors. The known vectors (hoppers and whiteflies), besides being contradicted by some research and current opinion, seem unable to explain “road effects”. They are both leaf feeders that tend to be in population decline at harvest. Furthermore, they are both adapted to dispersal by flight. They are readily visible and produce choking clouds when disturbed. One simply does not see them on harvested grapes or grape trucks. Whiteflies have sluggish instars and hoppers do not even undergo true metamorphosis with the larval stages looking remarkably like an adult. Trilobite looking whitefly instars credit Shetlar at Oregon State University. 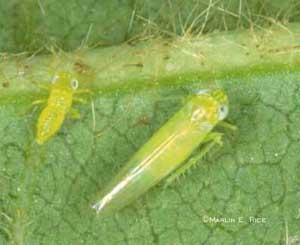 Grape leafhopper instars and an adult by Martin Rice at Iowa State. Although sluggish instars of mealy bugs which vector leafroll virus are known to become unlikely aviators by climbing shoot tips to launch into the wind, mealy bug adults have no ability to fly. For whiteflies and hoppers flight by adults is a vastly more efficient means of dispersal. If not whiteflies or hoppers, what? Sharpshooters are in the same family as leafhoppers and they have long feeding tubes able to reach into the xylem of plants. They are known vectors of bacteria, but not of viruses, and they have been shown to “hand off” Pierce’s Disease bacteria to common leafhoppers in grapes. Word has it they are being looked at, but sharpshooters are big and obvious, and absent a “hand off” to a more ubiquitous insect, they just don’t seem do have the population density or distribution in Sanapanoma to explain the rapid spread of bloch symptoms. Blue Green Sharpshooter UC IPM online. 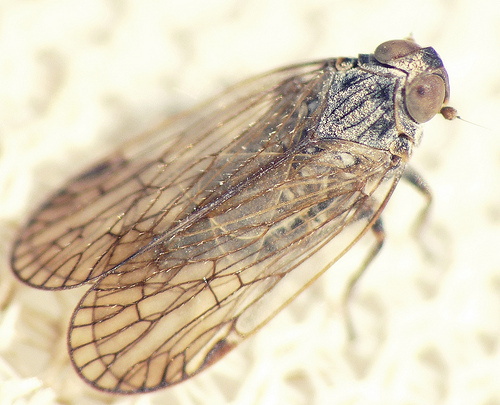 Cixids are another bunch of hoppy little guys in the Cicade family with leafhoppers and sharpshooters. They are known to vector the “bois noir” phytoplasma disease of grapes in Europe and a proteobacterium disease of beets. Rhonda Smith of UC extension in Sonoma County reportedly pulled in the EGVM traps to look at Cixids. Cixids are also leaf feeders which tend to spike in population early in the season. 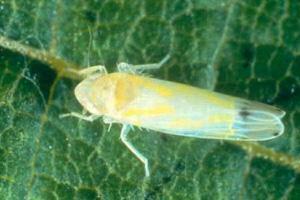 Speaking of phytoplasmas, a leafhopper is known to vector the phytoplasma responsible for “flavescence dore” which is spreading across Europe. The symptoms of this disease are remarkably similar to blotch. We ran broad spectrum phytoplasma qPCR assays on some blotch positive vines and they came back negative. What about mites? They are about the only vectors left unless you want to get into fungi or pollen. Nobody seems to be considering the Acari. There are three (barely) visible web spinning mites, Pacific, Two Spotted, and Willamette that are grapevine nuisances. None of them is a known vector of anything. Pacific and Willamette seem somewhat antagonistic since sulfur sprays commonly used in the early season to control fungus, and to which all mites seem susceptible to some degree, skew their relative populations, and generally delay their population spikes until after sulfur is discontinued. Even with the sulfur delay, populations of these mites fall to very low levels by harvest. There is a parallel universe of biological dark matter in the form of invisible mites. 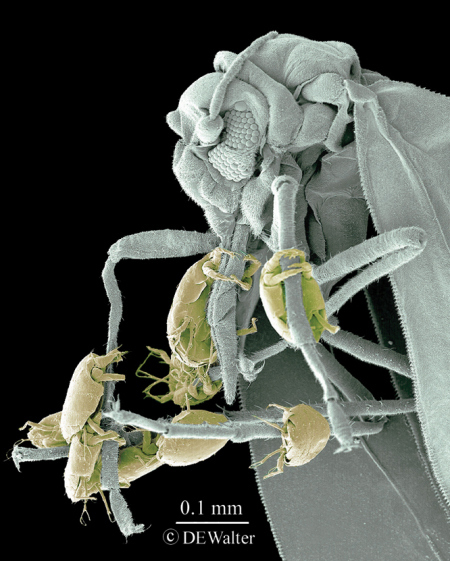 This amazing micrograph by D. Walter shows microscopic broad mites catching a ride on a white fly. Microscopic mites also infest bee colonies. 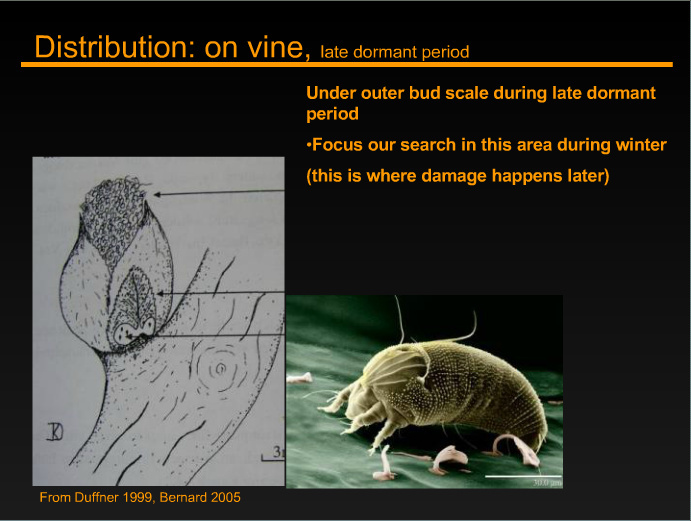 The Eriophid mites are present in our grapevines and are known virus vectors. Erineum mites, “strains” of which attack buds and cause leaf curl in addition to the well known “fools phylloxera” erinea galls on leaves, are microscopic but are very sensitive to sulfur. Dr. Monica Cooper of UC Extension Napa and Dr. Vaughn Walton at OSU have studied these by putting double sided scotch tape around canes to catch them. At least in Oregon there is also a microscopic “rust” mite, Calepitrimerus, which joins the three “strains” of Colomerus Erineum mites and likely a host of microscopic predatory mites as invisible armies marching up and down our vines. This from Dr. Walton shows a micrograph of an Eriophid mite and an illustration of where they winter over in the buds and scales. Eriophid mites are known to vector Secovirus in black currents and peaches, and Potyvirus in wheat etc., and in figs. There is another microscopic Acarid, Brevipalpus, which may be among us. This notorious mite with worldwide tropical and subtropical distribution is an infamous vector of Rhabdovirus. This plant version of rabies affects eggplant, coffee, passion fruit, and Orchids among commercial plants. Brevipalpus is also known to vector Bromovirus in cucumber, Potyvirus in dasheen, and so many unknown viruses that en entire category, Brevipalpus Transmitted Viruses or BTV has been proposed. The most well known BTV is Citrus Leprosis Virus. Dr. Childers (personal communication) has found Brevipalpus californicus on grape vines in the Central Valley. Micrograph from Kitajima et al 2010. 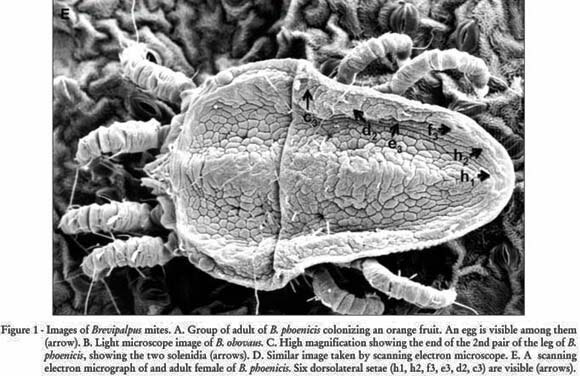 Microscopic mites as vectors can explain all of the known and supposed features of the spread of GRBaV. They are readily airborne and easily spread by wind and mechanical turbulence. They are spread by larger insects, birds, deer, and human workers. They explain both edge effects and road effects. They peak in population at harvest. They can explain how a truckload of grapes could infect a wild grape along a road miles from any vineyard. They have both the population and distribution to explain the rapid spread of symptoms. In the end we are left with a virus whose coat proteins hark back to the Permian. A virus which has existed in Sonoma County since at least 1940, yet whose current symptoms have exploded in the last six years to nearly every vineyard in Napa and Sonoma counties. A virus whose current symptoms may result from the work of vectors two years ago. A new vector relationship seems very likely. This new vector need not necessarily be a known Geminivirid vector, and in fact the known vectors and their ilk have been marginalized as suspects by recent research. The large, easy to see suspects are being exhausted. We may need to look to the microscopic dark matter of the Acari, they just mite be it. This entry was posted in Biology, Ecology, GRBaV, Red Blotch Disease, Wine. Bookmark the permalink. 1 Response to GRBaV, The Vector, Which Mite It Be?